You Are Invited To Judge! Each year DECA invites business professionals to serve as judges in our program of competitive events. 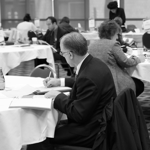 With Minnesota DECA, judging is a great experience. As you explore this page, take a moment to register below to help us judge at this year's State Career Development Conference at the Hyatt Regency Minneapolis. After exploring this page if you are still not finding what you need to know about being a judge for Minnesota DECA email us: jackie@tekstar.com. The Team Decision Making events are designed for a team of 2 participants, who work together to solve a problem or develop a plan to present to senior management (the judge). The judge (or pair of judges) evaluates the students presentation, and their response to questions. Judges take part in a role-playing situation with the high school student to evaluate how well the student demonstrates different marketing competencies. In these role playing events, students are required to accomplish a task or solve a problem by translating what they have learned in the classroom into effective, efficient, and spontaneous action. DECA has two types of written events: research and chapter projects. A judge working with a research project may either evaluate the written portion or the presentation portion regarding a marketing research and/or business plan that the student team has developed. Judges working with chapter projects will evaluate a chapter’s program of activities that was used to accomplish a specific goal, and the student’s presentation of that project. Invite A Friend to Judge! Minnesota DECA always is looking for new friendly faces to help judge at our State Career Development Conference. Send them a link to this page and invite them to join you and help judge at the upcoming MN DECA State Conference at the Hyatt Regency Minneapolis.